H E is one of those unforgettable characters you run across in life, the kind you read about in Reader’s Digest, but never think you’ll ever mett. 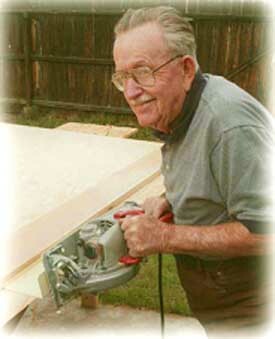 Mr. Vern, as I call him, will soon turn 93, and that in itself is remarkable enough, and yet, Mr. Vern set out at age 90 to build himself a sailboat, a Weekender. He liked the way the Stevensons’ had designed everything and he especially admired the bowsprit and the old fashion look of a gaff rig. 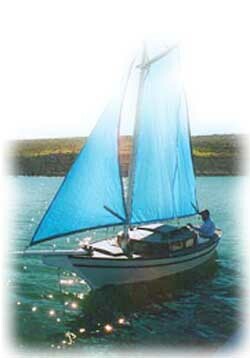 In just a few months he had built his boat, cut his sails, and secured all the rigging, all by himself. I helped him with only one part and that was the keel. The rest he did on his own. It seemed to me that this boat was something he wanted to do by himself, something he needed to do. Whatever the case, he built his boat and he did so at 90, did so by himself. However, he had to wait until spring before he could sail his boat. The winter, even in Arizona, was too cold for him to venture out on the water. In the meantime, he kept his boat in the backyard, and people came by just to admire it. Spring finally came, and with it warmer temperatures. “It’s warm enough now to go sailing,” he said. “The temperature is a respectable 105.” He set out, and those of us who were his friends went with him. Actually, he has a lot of friends and not all of them could come. I asked him why he didn’t take one his dogs with him on the boat, and he replied that he needed to check the boat out first, just to make sure everything was safe and OK. Yes, this lake called Pleasant Lake is wide, but so is life itself and that day Mr. Vern set sail across both. His eyes sparkled. 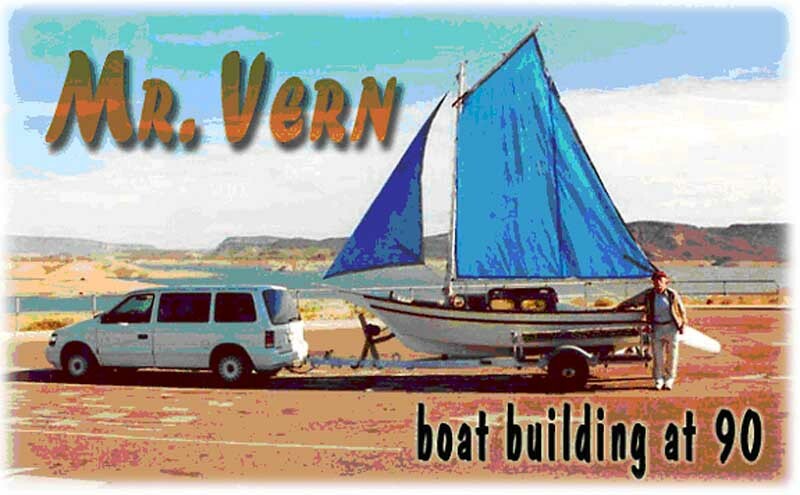 I mean it’s not just anyone who will let you build a boat in their backyard, but Mr. Vern is one of those rare people whose generosity and eagerness seem all too natural. As much as he had wanted to build a boat, he wanted even more for me to build a boat in his backyard. And so I did.We began building together. He helped me lay out the sole. He laughed and went back working on my sole. The mast you may see in the background belongs to Mr. Vern, and so does the Snipe. (Yes, he built that himself as well.) On the spar bench is my forward bulkhead. Mr. Vern and I were under a shade tree that day. It was a very hot day. W hat is that makes life viable even in our 90’s? I don’t really know. The answer is, perhaps, best left in the hands of God, but I am convinced of one thing, however— long life is somehow inexorably intertwined with a full life. The selfish, the irritable never really live; regardless of how long they may live, such people never live. His eyes sparkled. I mean it’s not just anyone who will let you build a boat in their backyard, but Mr. Vern is one of those rare people whose generosity and eagerness seem all too natural. As much as he had wanted to build a boat, he wanted even more for me to build a boat in his backyard. And so I did. Mr. Vern became ill that month, nothing serious, but I visited him often, working on my boat as much as I could. The progress was slow; the days were long; the memories, precious and vivid. So, for these reasons and others, I ordered Mr. Vern a BYYB shirt. I never told him what I had done. The shirt came in a few weeks later. I held up the shirt to his shoulders just to see how it might look on him. The shirt was a little large, but the fit was perfect. A day or two before another friend had come by to help Mr. Vern with some much needed yardwork. When I got there, they had already raked leaves, trimmed bushes, cut off tree limbs, and even pulled out a large stump. “My legs are really sore. It has been a long time since I pulled out a stump.” He smiled and made his way once more to his chair. On the kitchen table near his food and medicine lay the BYYB shirt. I think he liked the shirt. Mr. Vern and I went to a metal salvage yard. I need to buy some brass, and Mr. Vern came along just for the adventure.. As we rummaged through the metal scraps, Mr. Vern found an old trombone. It had long seen its better days. The slide was bent, and there were deep scratches and dents on every part of the horn. “I think I can repair this,” he said, “I ‘ve always wanted to learn how to play this fine instrument.” He bought the trombone for a couple of dollars, and took his prize home. In his younger years Mr. Vern had been a professional musician. “Maybe I can get Dusty to come over,” I suggested. Dusty is a young man who plays in an amateur trombone band. Dusty is also a budding woodworker and had wanted to come over and work with me on my own boat. Mr. Vern began restoring his trombone, and I began trying to make my my boat look better. One day as I was glueing the cabin sides on, I heard the sounds of a shovel and then, a hoe. I walked around the work shed and found Mr. Vern mixing concrete in a wheelbarrow. I had thought he was in the house with the trombone, but I was wrong. He looked a little tired. After all, mixing and pouring concrete is hard work. I helped him with the concrete, but not too much. This was a project he wanted to do himself. Mr. Vern came from a generation which prided itself on self-reliance. I suppose he wanted to pour that concrete just to prove to himself he could do it. I shook my head in amazement and went back to lifting thin plywood sheets. A few days later Dusty came over. Now, 90 years is a long time. In fact, it’s such a long time that most of us have trouble understanding just what it means to be 90 years old. So, let me use an illustration or two. If you are 50 years old, there is as much difference between Mr. Vern and you, as there is between you and a 10 year old child. It’s that many years. And if you are 40 years old, the difference is even more dramatic. The same child, of course, will not be born for another 10 years. And if you’re 30 years old, the difference is astounding. You will have turned 60 before that child is born. It is a long way to Tipperary, and longer yet to 90 years. The last few days have not been good ones for Mr. Vern. Oh, he’s still working on projects, always learning something new and different. That keeps him young, I think. Just the other day, Bill Olney gave him a digital camera, and Mr. Vern has been taking picture of everything that moves and everything that doesn’t. On one wall in his house there is old metal sign about fresh milk and cows, a sign from the 40’s or 50’s. It is an antique, and therefore, worthy of a photograph. Outside he grows some roses, and these, too, have become his models. “I’ve been working on restoring that trombone. You know, the one we found at the salvage yard,” he said. He must have worked on that trombone for a month before the slide would move. Dusty came by, and they played a few notes together. Dusty plays in a band. He also has done some woodworking of late. In fact, recently he received a commission to build some furniture for a client. It was his first commission. “Wow! That’s the problem. I couldn’t find C,” replied Mr. Vern rather wryly. A smile came across his face. 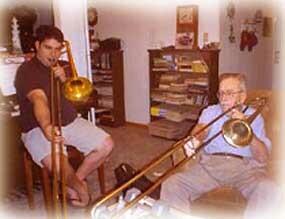 In his younger years as a professional musician, Mr. Vern had played the trumpet, but until now he had never attempted playing a trombone. “I’ll soon get the hang of this,” he said. And I suppose he will. Something there is about musicians, I suppose, even when the musician is 92 years old. “I really enjoyed playing the trombone. Tomorrow I’m going to start riding that bicycle. That’ll help me build up some air,” he added, pointing toward the garage where the bicycle was kept. F or a few days he rode that bicycle up and down the street where he lived. And then it happened. Without warning, a man came running up behind Mr. Vern and pushed him off the bicycle. He then pulled out a gun. “Stay down,” he commanded as he looked cautiously around, apparently hoping that no one had seen him. He grabbed the bicycle and rode off, leaving Mr. Vern helpless on the ground. Mr. Vern did limp around for a few days. There were a few bruises and a few scratches. Fortunately, though, there were no broken bones. When you’re 90, a fall can be more than a fall. It can be fatal, absolutely fatal. Last week, though, came an even more trying time for Mr. Vern. 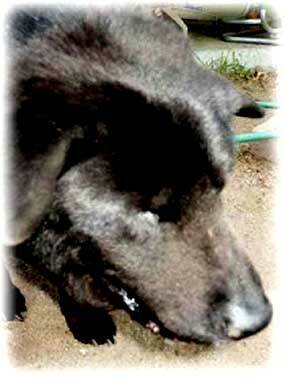 One of his dogs had to be put to sleep. It was at that point that his voice broke. The vet came, and papers were filled out. We took Lizzie into the back yard. “I can’t do this,” Mr. Vern said. Tears swelled up in his eyes. I offered to help, and Mr. Vern walked slowly into the house and closed the curtains. In a few minutes, it was all over. Lizzie had been a nice dog, the kind that always came near you and waited to be patted behind the ears. I patted her on the head and spoke softly to her as she died. “I’ll miss her,” he said with a deep sigh. I am sure that he will. She had been with him, at his side for many, many years. “About me?” His voice rose as if in disbelief. Mr. Vern moved the other day, to a larger house, one with fruit trees. Near a fireplace mantel stands a picture of a younger man, a picture taken most likely long before you, or I were ever born. 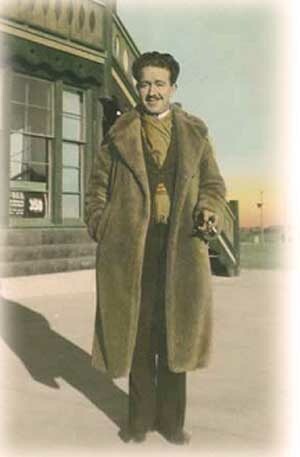 He owned an airplane then. He still flies, but now only in his memory and stories. He did, however, build a boat at age 90, and sailed it at age 91. That is difficult for me to comprehend, but whether I understand it or not, I do understand some of the vibrancy and the depth in living. We probably get out of life just what we put into it. In a real sense, we make our life. We shape our own destiny. No, we do not choose everything that happens to us, but we do chose how we respond. And that response makes all the difference. We shape our very destiny, and if we do not live all the days of our life, we have only ourselves to blame. 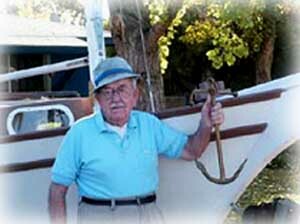 Mr. Vern built his boat at 90, and sailed it at 91. Reprinted from Gaff Rig, Spring 2005, a publication of BYYB, an organization of rabid amateur boatbuilders and sailing afficionados. Used here by kind permission. Mr. Vern passed away on December 5, 2008.